Rental is the latest development in temporary ownership of luxury items. Previous temporary ownership models include fractional ownership/timeshare, mainly in connection with property assets although more recently with private jets, yachts and classic cars, and by reselling on the second hand market. Whilst the concept of renting is age old, ecommerce sites like Avelle.com (formerly Bagborroworsteal.com) and from-bagstoriches.com, both founded in 2004, have led the expansion of this segment. It is no coincidence that this phenomenon has emerged during the second wave of dotcom expansion: its success stems directly from the success of internet sites such as Ebay and Portero in highlighting the secondary market value of small luxury items and in changing consumer attitudes towards ownership. The internet has also crucially provided scale necessary for these capital intensive sites to work b y allowing them to operate on a national and potentially international platform. Other elements which have fuelled the growth of luxury item rentals include the shortening of fashion cycles, resulting in consumers wanting more churn in their wardrobes. The segment is in its infancy and the key players are still exploring their business models. Avelle started off b y renting handbag s with unit values of between $200-400 but its users kept on ask ing for higher value items. Now the site has a much higher proportion of couture and high fashion items. Both Avelle and frombagstoriches have expanded their offerings; the former to jewellery, sunglasses, luggage and most recently to watches, whilst the latter expanded the services it offers to include refurbishment of customers’ own bags as well as the possibility to rent customers’ bags on their behalf. We do believe there is potential for this market to grow further in bags, accessories, watches, jewellery and to a certain extent sunglasses. These products fit the bill in terms of ease of transport and fashion content and are also more durable than, say clothing or shoes. Companies operating in this segment are taking a significant stock risk, therefore getting the product right will be crucial to their survival. Another key issue in the case of watches and jewellery would be whether insurance costs would cripple the economics of renting higher value items. Treading on the toes of luxury brands? According to sector players, the luxury industry’s response has been at best muted, if not negative. “Many manufacturers view this as a bastardisation of the values of luxury” says Dan Nissanoff, author of Future-Shop: How to Trade up to a Luxury Lifestyle Today. Issues such as lack of control over distribution, con- cerns over product quality and authenticity as well as the bypassing of the brand’s own carefully designed store environment echo the industry’s initial reticence towards third party ecommerce sites in the late 1990’s/early 00’s. Added to this the fact that luxury manufacturers benefit in no way from the secondary trading of their products, one can see why the industry is reluctant to embrace this phenomenon. 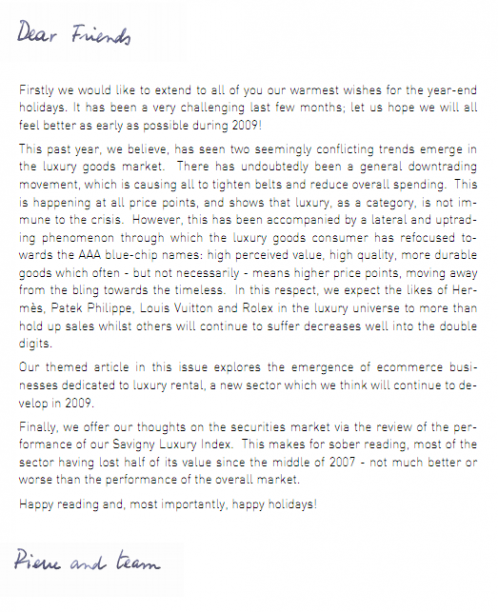 As has been the case with ecommerce of luxury goods (see Savigny Newsletter Issue 4, June 2007), brands’ potential concerns that this channel would focus on low value items and the less affluent customer are proving to be unfounded. “I was surprised at our customer profile… I thought this would be an entry point” says Karen Richter, founder of frombagstoriches.com. Mike Smith, CEO of Avelle, agrees: “Our typical user is a college graduate in a managerial position… who owns 20-25 bags… and keeps on buying bags” adding “the demographic of the typical Avelle customer is higher than the demographic of the typical customer when I was at Nordstrom”. Affluent consumers also appear to have less of an issue about owning as opposed to renting and are therefore more likely candidates for this segment. Whilst it is impossible to replicate the shopping experience, rental companies have invested in high quality packaging for their products. They also have quite stringent quality control procedures in place and extensive refurbishment programmes for returned rental items so as to ensure utmost product quality. Another major concern for brands is that the rental of luxury items will eat into their sales. Mike Smith argues that “this will be a third leg to the consuming stool: buy new, buy used and borrow” and that “this allows customers to be more adventurous”. Frombagstoriches offers the possibility to purchase any item hired b ut has very little uptake on this option. Both Avelle and frombagstoriches claim that their customers have full wardrobes and use rental as a means to rotate other items without using up too much additional wardrobe space. Dan Nissanoff argues that rental is a more efficient use of capital and allows consumers to benefit from the use of several items in the place of owning one. It is clear that the customers who use these sites can afford to buy instead of renting and that they actually are continuing to buy luxury goods; so we would argue that so far there is no evidence cannibalisation of full ownership. However the current economic crisis might lead us to a different conclusion. Business across the luxury rental sites remains brisk although this may be partly attributed to the relative youth of the segment. There are however a number of factors that bode well for it. The key difference between rental and other forms of temporary ownership is that there is no tie-in, much more flexibility in terms of product available and time span of possession, and the risk of ownership remains with the provider. Consumers may therefore feel that they are taking less of a risk in renting these items as opposed to investing in a piece that may g o out of fashion faster than expected. The option of renting may also b e a more appealing alternative to trading down the luxury value scale as a means of saving money: “Rental companies might actually thrive in this environment. People that might have not looked at this before as a way to maintain this lifestyle may actually do this [rent]” says Dan Nissanoff. The luxury for hire business model might indeed allow luxury consumers who have fallen on hard times to continue sporting that oh so desirable item of the season. Will luxury rental prove to be one of the few businesses to benefit from the current crisis? Looking back at the past couple of years, we see a case of two steps and two falls, as evidenced by the graph below. Our SLI, which performed broadly in line with the FTSE All World Index over the period, happily spent all of 2007 in a well-defined tunnel above its point of origin. 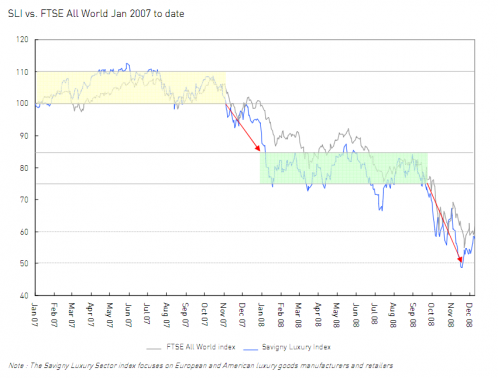 At the turn of the year, it preceded the world index into a 25% tumble before settling into a second, significantly lower tunnel – albeit with greater volatility. The SLI took its worst dive coming into Fall, falling by 42% from early September to mid November in response to the unravelling of the banking crisis which started with the Lehman Brothers bankruptcy on 15 September. Daily share price fluctuations have increased markedly during the year, with stocks recording daily percentage point changes in the high single digits to mid-teens (e.g. : LVMH +12.9% on 13 October, -11.2% on 11 November). There seems to be little correlation between news flow and share prices which leaves investors with a total lack of visibility as to the outlook of the sector. In spite of the frightening volatility, the market seems to have recently stabilised and some observers believe it could have bottomed out. We certainly hope so but are also aware that more bad news might be on its way after what looks to be a very tough Christmas at retail. Since peaking in June 2007, the average EV/EBITDA multiple for the sector has dropped by 35% from 13x to 8.5x. 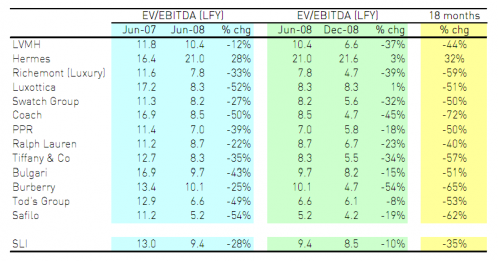 Excluding Hermès whose rating seems abnormally high, the average EV/EBITDA multiple is currently 6.2 x, well below the historical lows of 7-8x reached during the economic slowdown of 2001-2003. We believe two waves of de-rating took place. The first wave, described in our last newsletter (Issue 6, July 2008), resulted in a polarisation of valuations across the sector. It hit companies with an exposure to affordable luxury through either brand positioning (Burberry and Tod’s) or product focus (eyewear sector) and those lacking presence in the emerging markets (Bulgari and Tod’s). Stocks with a strong bias to-wards the US also took a beating (Coach and Tiffany). The second wave, which happened after the summer, left practically no stock untouched, although arguably some had already bottomed out in the first wave, such as the eyewear companies. The affordable luxury category was particularly hard hit again. Burberry lost another 54% in its EV/EBITDA rating. The watch sector also took a serious beating, as we had predicted it would in our last newsletter, Richemont and Swatch showing a decline in their EV/EBITDA multiple rating of 39% and 32% respectively. Finally, companies which had until then appeared to be recession-resilient owing to a wide product offering and exposure to emerging markets were not spared; for example LVMH lost almost 37% in its rating since June 2008. Emerging markets which were viewed to a certain extent to be the last saving grace for the sector have lost their shine. China’s growth is slowing; Russia’s oligarchs are worth $250 billion less than a few months ago; India’s top 40 bollygarchs have lost $212 billion, or 60 % of their combined wealth, over the past year. One stock continues to defy gravity, abnormally so in our eyes. Owing to its super luxury brand positioning and ongoing bid speculation, Hermès’ rating increased by 32% since the peak of the market in early June 2007. Could a small float, a peculiar legal structure, rules pertaining to the company monitoring of family held shares and the retail versus institutional make-up of the shareholder base provide keys to under- standing such a situation? The only real piece of good news recently has been the currency movements. The US Dollar and the Japanese Yen have appreciated against the Euro in the past few months (and obviously the British Pound, which is seemingly in free fall). This has brought much needed oxygen to two very large markets which had been comatose in the last eighteen months. Could it last? Nothing is less sure, and we do not see any structural reason to support the continued strength in the Dollar. 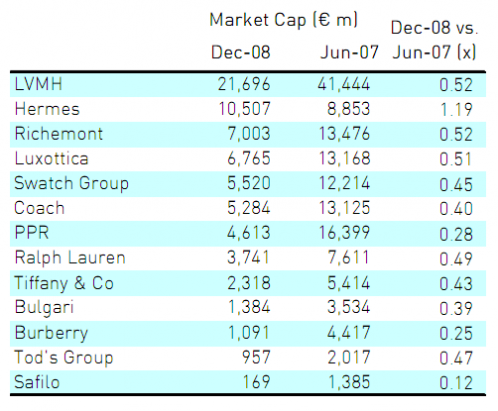 The world has definitely changed since June 2007, with the mighty stocks of the luxury world losing approximately half of their market capitalisation. Some did even worse: Burberry was left with a quarter of its value of eighteen months ago, and Safilo’ s capitalisation was almost wiped out. 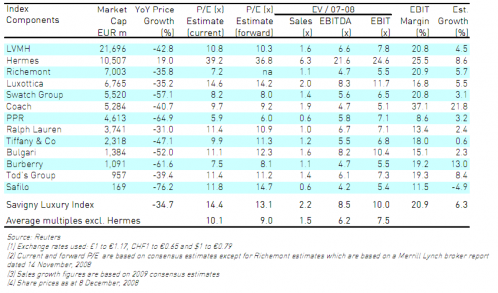 The most stunning development however lies in Hermès’ market value now being over twice that of PPR, when almost the reverse was true in the summer of 2007.